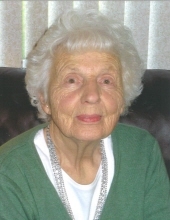 EMERTON, Janice Aileen (Childs) - Age 89, of Linden, passed away March 22, 2019. Funeral services will be held 11 AM Tuesday, March 26, 2019 at Sharp Funeral Homes, Linden Chapel, 209 E. Broad St., Linden. Visitation will be held from 4-8 PM Monday. Janice was born October 4, 1929 in Linden, the daughter of Calvin and Idabelle (Stiff) Childs and was a 1947 graduate of Linden High School. She was married to Edward Charles Emerton on November 15, 1952. Janice was a member of Linden United Methodist Church. She worked for Farner's Drugstore in Linden, General Motors Buick Division, Linden Community School and retired in 1984 as the Financial Secretary of Court Street United Methodist Church in Flint. Janice enjoyed life, family, cooking, baking, gardening, flowers, traveling, casino trips, shopping, getting her hair done and manicures, desserts, friends, but most of all she loved spending time with her children and grandchildren. She is survived by her children, David Emerton, Daniel Emerton, Denise (Rick) Ray; grandchildren, Betsy Emerton, Brad (Jen) Emerton, Kelly Emerton (Greg) Rommell, Anne Emerton, Daniel (Eli) Emerton, Chrystal Ray (Richard) Polzin, Karen Ray (Brad) Mirek, Cheryl Ray (Mike) Zilinski; several great-grandchildren; brothers, Richard Childs and Gary Childs; several nieces and nephews. She was preceded in death by her father, Calvin Childs in 1991; mother, Idabelle Childs in 2000 and her husband of 58 years, Edward Charles Emerton in 2011. The family would like to thank The Medical Team Hospice of Flint, Administration and Staff of Bella Vita Senior Living Memory Care of Grand Blanc, Vicinia Gardens Intermediate Facility of Fenton and Janice's caregivers and friends, Diane Sipes and Joyce Nixon. Those desiring may make contributions to Linden United Methodist Church. To send flowers or a remembrance gift to the family of Janice Aileen Emerton, please visit our Tribute Store. "Email Address" would like to share the life celebration of Janice Aileen Emerton. Click on the "link" to go to share a favorite memory or leave a condolence message for the family.